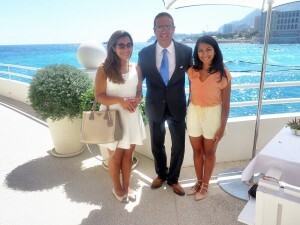 Our top treat in Monaco was a visit to The Montecarlo Beach Club’s restaurant Elsa. With tables set on the stunning scenery ahead of Montecarlo Bay, you can sit back and relax as you gaze ahead at the little boats in the distance of a mezmerising back-drop. With locally sourced, fresh, 100% organic ingredients, the culinary surprise is led by Chef Paolo Sari and an extraordinary team, who take pride and passion in the exquisite service they offer you. 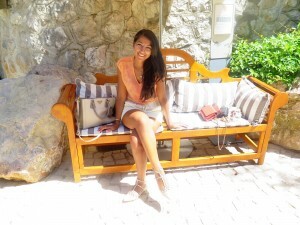 We visited on a scorching afternoon, for a cooling, refreshing and revitalising lunch. 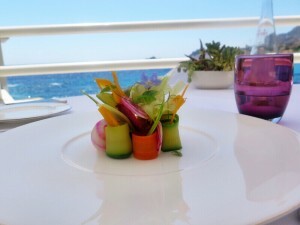 Our first plate was an arrangement of fresh garden vegetables set upon a base of white cocoa bean puree. The presentation was so exquisite that I almost did not want to eat this apetiser, only to find that the taste superceded it’s aesthetics. Who knew raw vegetables could be so ravishing and crunchy, beautifully cut to absolute artistic precision – yes, the creator behind this was indeed an artist in his craft. 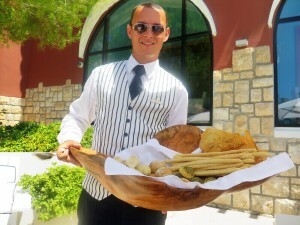 Now there are restaurants where you’re served one piece of bread, as if it is the Last Supper – and no more. You either eat it all too quickly, and spend the rest of the evening pining over more bread in between your courses, or you taper it out, which serves to send the 20-minute “I’m full” signal to your brain, and find that you can’t even eat your second course. Not here. The warm mini-bread selection, which taste more like pastry, is abundant and over flowing, and I warn you to exercise some self-control, because I for one could not. 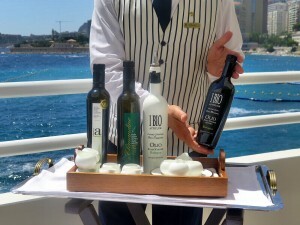 This was especially the case, once we were treated to an olive-oil tasting selection from around Europe: Spanish, French and Italian oils expertly presented by one of the principal waiters, Roberto, in a clockwise fashion to aid your tasting experience. 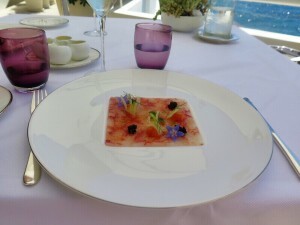 The prawn carpaccio with citrus and fennel, was so finely made, it looked like coral marble, fit to be garnished only with the most optimum caviar and tiny monagascan flowers. 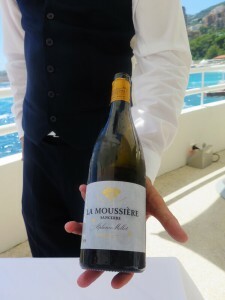 Despite it’s marble effect, it was exquisitely soft, and melted in our mouths, paired perfectly by sommelier Francois, with an aromatic and fragrant Sancerre wine. 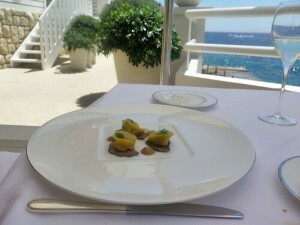 Besides the carpaccio, we sampled a small mid-course plate of tortellini with mushroom and black truffle. Three tortellini shells may not sound aplenty, but the wholesome flavor of both the truffle and homemade pasta, adds to the fullness of this small, but highly satisfying dish. Our main course was red mullet beautifully fragranced with a myriad of flavours only made more bold by the surrounding whisks of a garnishing seafood sauce. 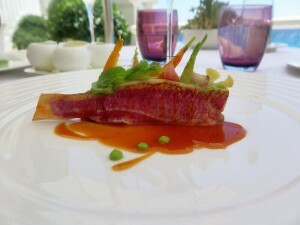 It was cooked to precision, and the accompaniment of miniature vegetables bursting in essence and seasonal taste, provide a strong platform for the red mullet to stand out. 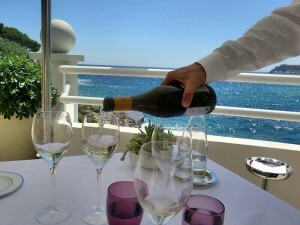 As we sat back to – mainly just inhale – and relax in between courses, one thing stood out against the tranquility of the sea and sand ahead of us: the friendly, convivial atmosphere of this polished, calm, white washed restaurant. 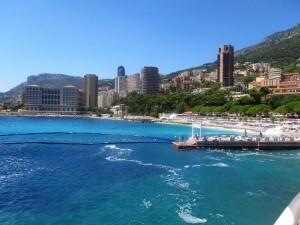 A few evenings earlier we had been dining nearby at Nobu of Montecarlo, with a similar sea-view setting before us. One thing which was missing that evening, certainly rang true for Elsa’s accomplishments: a team of staff so happy to have you dining with them, and equally attentive to all their guests; diligent in their service and extremely warm in their hospitality. 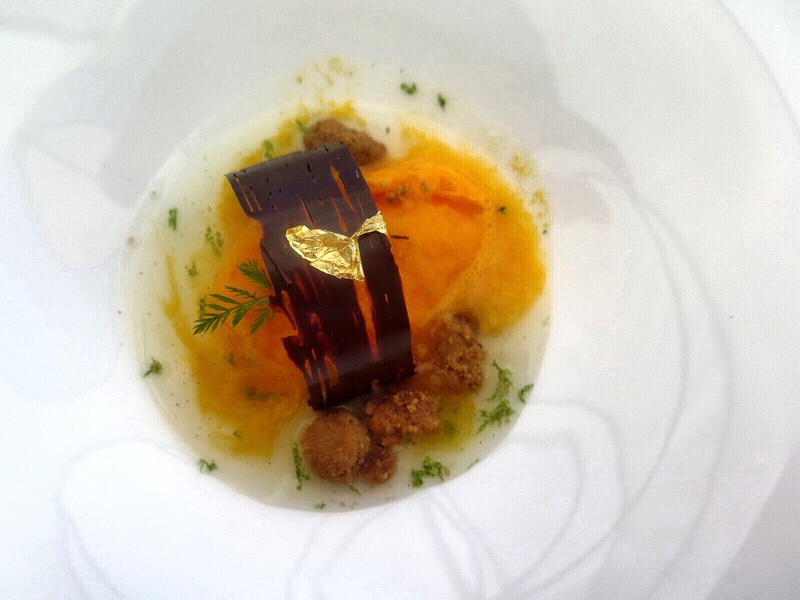 Our final course was the ultimate palette cleanser: an apricot and carrot sorbet, with a lime garnish, covered with a chocolate bridge, and a dash of gold-leaf. The fresh, tangy but sweet, natural flavor of the sorbet was true to it’s vibrant colour. It was delightfully cool and refreshing with the woman chocolate bridge adding a sweet crunchy factor to the texture. The gold-touch and floating honeycomb pieces confirmed the majestic nature of this final plate. 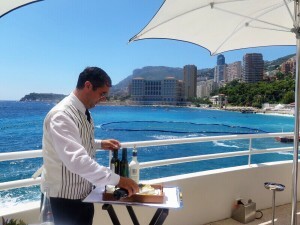 Across all domains this restaurant has achieved above and beyond in service, quality and presentation. 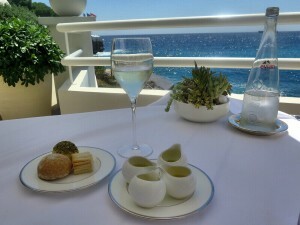 The sound of crashing waves provide the ambience to match the nature of the fine food at Elsa, and is only accentuated by the breathtaking views of Montecarlo’s coast; a worthy backdrop to one of it’s true luncheon gems.